Well, every weekend, we cut the commercials in half and double the music! Starting every Friday at 5 with The Rewind Traffic Jam, we turn up the volume on the Greatest Hits of the 70s and 80s! 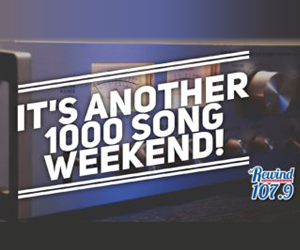 Listen for your favorites, with fewer commercials, every weekend on Rewind 107.9. Plus we bring you flashbacks with M.G. Kelly and “The Classic Hit List” on Saturday Morning at 8. Scott Shannon counts down your favorites with “America’s Greatest Hits” every Sunday Morning, starting at 8. Sunday night starting at 7, its one hit wonders and awesome flashbacks from the 70s and 80s you never thought you’d hear again with Barry Scott and the award winning “Lost 45s” followed by a classic concert recreation with “Live, in Concert” starting at 10. One Thousand Song Weekends… the perfect soundtrack to your life!